Join your conference call without dialing or remembering an access number. The Connect App can be used by the chairperson and the participants. 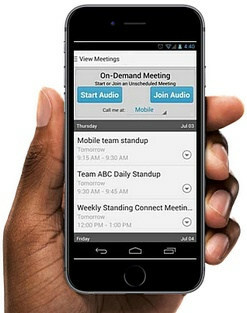 The Connect App works with your smartphone or desktop and enables you to start or join a meeting with a tap of a button. You never have to remember dial-in numbers, access codes or passcodes again. You can control your entire meeting right from your smartphone or desktop with the Connect app. It's all right there in front of you. Regardless of where in the world you may be located, as long as you have access to Wifi, you can get an instant callback to your phone to join your conference call meeting. This free smartphone app automatically joins you to the conference room without dialing an access number. You are located in a country that has no access numbers and the Connect App may be the only way to connect to your conference call. You are located in a country that has a tediously long access number and you do not wish to remember it or dial it. 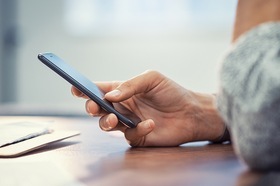 Savings - The Connect App per minute rates which share the same rates as dial-out, are typically lower than toll-free dial-in rates. It's a free optional tool that many customers find very useful. There are no in-app purchases. No. The Connect App instantly sends a call back to your phone over normal phone lines, not the Web. What rates apply when using the Connect App? How do I get the Connect App? A download link is included with your Expanded Plan activation welcome email. It's a free app. 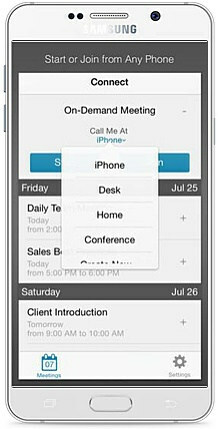 Displays a simplified view of all your calendars with all your current and upcoming meetings that includes all calls on the iPhone calender. Start your meeting with a single click of a button. Displays a simplified view of all your calendars with all your current and upcoming meetings that include all calls on the Android calender. Presents an up-to-date meeting view of all your calendars. Allows you to join or host a meeting with one click from within your Blackberry Calendar menu. Displays a simplified view of all your calendars with all your current and upcoming meetings including all calls on calender.